It has been two years since the inaugural International Cup, held in Melbourne. The event was a great success and plenty has been said and written about it, but there have been many new developments in the world of Australian Rules football, and hopefully a lot of new people have become interested in this emerging aspect of the game. So worldfootynews.com thought it would be worthwhile reviewing the 2002 event. Later, we will preview the 2005 tournament. Many attempts have been made to spread Australian Rules football around the world over the past 150 years, but only ever with moderate success at best. Countries such as Papua New Guinea and Nauru are some of the better stories. Then the 1980s and 1990s saw the sport start to take serious hold in a handful of new countries, with the increasing number of expatriate Australians and the emergence of the Internet and cable TV leading to increased awareness and organised leagues forming. The Arafura Games, named for the sea off the Northern Territory (Australia) coast, were held every two years in Darwin, and in 1995 Australian Rules was included for the first time. Several countries competed, and the idea of bringing the nations of the world together for an international footy tournament started to take hold. The International Australian Football Council, in one of its incarnations, actively pushed for the first World Cup to be held. 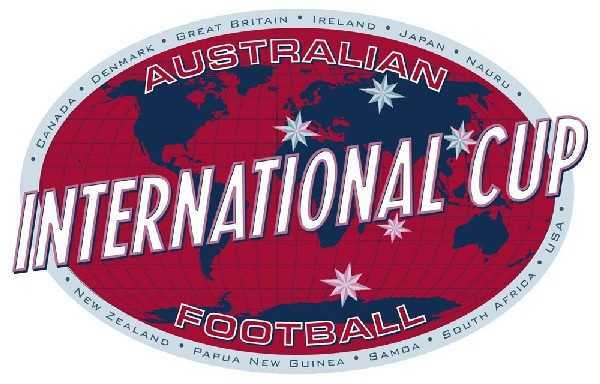 Leaving politics aside, what ultimately emerged was the 2002 International Cup, supported by the AFL and the IAFC (which subsequently dissolved itself in favour of the AFL International Development Committee, although several splinter IAFCs continued on). It featured 11 countries taking part at Amateur level in the biggest nation versus nation Australian football tournament yet. Australia was the notable absentee, due to them being deemed too strong - hence the series was not given the title World Cup. The sides were drawn into two divisions of 5 and 6 teams. Papua New Guinea were warm favourites, based on their long history in the sport, and strong Arafura Games form. 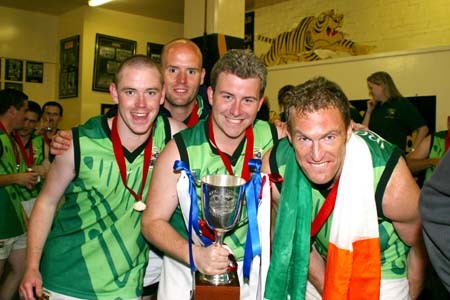 After a huge organisational effort from all involved, the tournament commenced on the 14th August 2002, with an opening ceremony at Sandringham Oval. 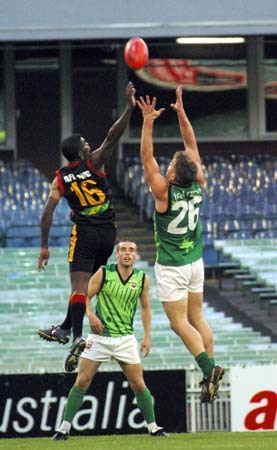 All teams played a series of round-robin matches on various suburban grounds around Melbourne, including several AFL club grounds. Modest crowds were in attendance, with curious on-lookers no doubt wondering why they didn't know anyone else played Aussie Rules. Hopefully the tide is slowly turning on that score. The full set of results follow. At the end of the minor round games, PNG emerged as top of Pool A, and Ireland atop of Pool B. Both were undefeated and went through to the Grand Final. A series of classification matches were also played to determine the final standings of the lower place getters. 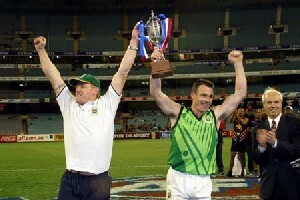 The Grand Final, to determine the inaugural International Cup champions, was held on August 23rd at the famous Melbourne Cricket Ground (MCG) as a curtain raiser to an AFL night match between Hawthorn and North Melbourne. Both countries were undefeated, with the surprise performers being Ireland. Although they have a rich history in Gaelic football, a very similar sport, their Australian Rules league was only a couple of years old. In a tough contest, the Green Machine, as they were dubbed by the Australian media, shut down the Papuans. There are numerous opinions on how the Irish came to defeat such a fancied opponent. Some have said PNG got stage fright, some that the Irish flooding tactic stifled their run, others that the strong soccer and Rugby backgrounds of the Irishman served them well. What is clear is that they put in a far superior effort to comfortably win the International Cup and make the rest of the football world take notice.